In a medium saucepan, bring the juice, preserves and vinegar to a boil. Lower the heat and cook until thick and syrupy, 7-8 minutes. Coat the beets with EVOO and season with salt and pepper. Grill until well marked and tender, 10-12 minutes. Top with the cheese. In Recipes-list.com we have selected the most viewed recipes from category - uncategorized . Enjoy the best recipes specially selected for you! 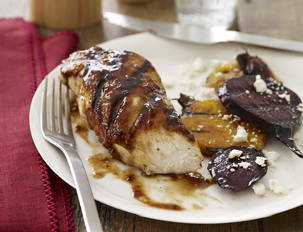 Apricot-Balsamic-Glazed Chicken with Grilled Beets is the right choice that will satisfy all your claims.